Peppermint grows incredibly lush at the farm and smells amazing! Peppermint is an interesting plant because it has many of the nervine properties common to mints while also having both hot and cold properties. It is cooling to taste but has a stimulating and warming aftertaste. Peppermint has a very high menthol content (50-75%), along with flavonoids, acetic acid, tannins, resin, gum and triterpenes. 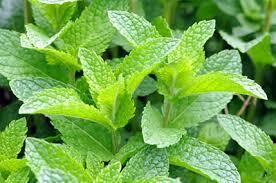 Peppermint is traditionally used as a remedy for fever, chills, flu and indigestion. Menthol is antispasmodic and an analgesic which helps to settle the stomach and open the sweat pores and peripheral circulation through relaxation. A combination of yarrow, elder and peppermint are excellent for colds, fevers and flu, particularly those conditions brought on by sudden exposure to cold. The secondary warming/stimulating effects of peppermint can be seen traveling through the lymphatic system of the body where it reaches deep and then travels to the periphery of the body (where we see its effects on fever, flu and stomachache). Peppermint increases the flow of water through the lymphatic organs and has a cooling, moistening effect on hot, dry conditions in the interior and periphery of the body. Peppermint oil has a restorative, regenerative influence on the immune system by stimulating the spleen, improving the breakdown of old red blood cells and increasing white cell production. Infuse dried or fresh leaves, 1/4 – 1/2 teaspoon per cup. Serve hot, warm or cold. Tincture the fresh plant in 100% alcohol or glycerin or the dried plant in 75% alcohol: 25% water. The four herbs in this recipe combine well to create immune-boosting infusions, syrups or tinctures. Make an infusion in a 1 quart jar by combining 2 tablespoons dried red clover, 2 tablespoons dried peppermint, 2 tablespoons dried elderberries and 1/4 teaspoons powdered ginger. Drink 1 to 3 cups daily. The herbs in this tonic are super nutritious and can be taken as a tea, syrup or tincture, using the same herbs in the same proportions. Infusions are great for long-term tonics. Make an infusion with 2 tablespoons dried spearmint or peppermint, 2 tablespoons dried nettle and 2 tablespoons dried dandelion root and/or leaves. Drink 1 to 3 cups daily. The dandelion root and leaves can be prepared separately by making a decoction with the root (heating the roots in water over flame) and an infusion with the leaves. This ointment is an excellent first-aid treatment for external wounds and injuries. Use liberally on cuts, scrapes, burns, bites, stings, itchy skin, ringworm and eczema. Use fresh but lightly wilted herbs. Do not use on deep cuts, as comfrey will heal the surface tissues first while the deeper layers of tissue may harbor infectious bacteria. Step 1: Make an oil infusion with the following herbs: 2 T yarrow, 2 T comfrey, 2 T elder leaves, 2 T red clover blossoms, 2 T plantain leaves, 1 T peppermint leaves, 1 T calendula petals and 1 t hemlock tips (and/or cedar or juniper tips). Chop all the herbs thoroughly and place in a clean glass jar. Pack the jar tightly and nearly full if you’re using fresh herbs. Pour 2 cups of oil into the jar and use a knife or spoon to poke around the sides to release air bubbles (which can cause spoilage). Make sure the herbs are covered (or mold can form), clean the rim and cap the jar tightly. Place the jar in a cool, dark place and shake daily for two to four weeks. Strain the liquid, and press the herbs firmly to get all the liquid out. Bottle the oil, label and store in a cool, dark place. The oil will last six to twelve months. Step 2: Make the salve. Take your bottled oil, pour it into a saucepan. Chop or shave 1/2 cup beeswax into the saucepan and heat gently. As the wax melts, you can add 15 drops rosemary essential oil and 15 drops clove essential oil if desired. Once the wax is completely melted, pour the solution into a glass or ceramic container. Cap the containers tightly and allow the salve to cool. Don’t move the containers for an hour as they cool. The salve should last for 1.5 – 2 years. Cautions/Contraindications: Not to be used for bowel complaints with inflammation – pain on pressure, tongue dry, with reddened tip and edges (Matthew Wood). The tea and tincture are safe for general use but overindulgence can cause stomach aches.